There was a time, not so long ago, that American’s people placed great value on items made by hand by her own Amish people. As the years progressed, societies converged together to ask for products to be created in shorter time for less cost. As the demand for such low priced convenient items began to swell, the need to employ cheaper labor across the seas became the most reasonable solution. One by one the items that symbolized pride in one’s work like Amish Quilting began to disappear. Most of these items were seen as disposable. But some of these items endured due to a small demand of people to purchase something made by hand. One such item that is still being made is the Amish quilt. As far back in American history that we can look, we see the basic Amish quilt as something that people did not just desire, but actually needed. It was often passed from generation to generation in a family. Non Amish farm people, much like the Amish; used sewing circles as a time of fellowship, news passing and gossip. These sewing circles were the social hub, much like the newspapers and Internet of our times. It was in these sewing circles that most Amish quilts were created. When most of us think about a handmade quilt, we think of the Amish. We picture the Amish women in their plain dresses crouched over their fabric, tediously performing each stitch. 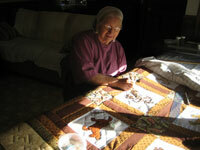 The pride and honest hard work in the Amish quilt shows through with every meticulous pattern. Their strength and durability is what makes the Amish quilt what it is. When Amish quilts first began to emerge they were done in basic colors and patterns. Amish did not believe in extravagance in anything from their housing, furnishings, clothing and any product they created. The Amish quilt was produced for nothing more than keeping warm. As the making of the Amish quilt was passed from generation to generation, color and more intricate patterns were introduced and accepted by the Amish quilting women. As outsiders of the Amish began to acquire these more colorful quilts the demand for these quilts began to rise and so did their popularity. Quilts began to be given as wedding gifts and gifts for special occasions. There were even special patterns that artistically described these occasions on the quilt. Women that bought these Amish quilts or were given them as a gift, treasured these quilts; proudly displaying them or tucking them safely in a hope chest for their children. Yet, as large big box stores began arriving across America the purchases of items, including quilts, were made to the lowest prices offered. People began looking towards convience, price and less towards tradition. The Amish quilt almost became an item of the past; a hidden symbol of a hard working, simple people who place tradition and diligence above all else. Quilts were sold at garage sales, consignment or just placed in the back of the attic; forgotten. The purchases of Amish quiltsfrom the Amish were almost unheard of. As America moved further and further into technology, the Amish and their goods were shunned. They were seen as strangers on our land, holding firm to the plain way of doing things. The Amish were seemingly resistant to the changes of America, withdrawing further from the small cities to the last remaining family farms and towns. The quilts that are purchased at the big box stores are nothing similar to the Amish quilt. The fabric is cheap, the colors too brilliant and the patterns have no story behind them. Those who purchase these store quilts are usually swayed more by the price than by the symbol of the quilt. Most of these quilts will never be passed down to the younger generation, never be given as a prized gift to a newlywed couple and will never be displayed as a piece of American Art. While there are quilts out there to be purchased that are beautiful and are even priced higher, it holds no pride of the Amish quilt. When searching on the Internet for handmade quilts, most of the links that you come across are for "genuine, handmade Amish quilts" You can find website after website promoting and selling Amish goods. The words that are used are pride, hard work, quality and durability. Items with these kind of descriptions are becoming harder and harder to find in these times. Items that actually fulfill these types of descriptive promises are even more rare. Commercial companies just can’t offer these types of products to the consumer and still offer the low big box store prices. The peoples of America have started to change their way of thinking though. They have finally begun to see the value of hard work again; to place a price on things made by hand. The Amish quilt has once again become a symbol of that hard work and simple handmade goods. The quilt is being brought back out of the attics and sold at high prices to those desiring a piece of America’s Plain People. But we have begun to lose our Amish quilters. The Amish are just a very small percentage of our population and with all the different types of Amish, the quilters are just not as prevalent in the societies as they once were. The ease of acquiring an Amish quilt has diminished and the price of the Amish quilt has gone up. Even though the price of the Amish quilt has gone up, the demand for the quilt has justified these costs. To be able to purchase a symbol of hard work and tradition is worth the asking price. Even though America is losing its Amish quilters, we are holding tight to the belief that this small percentage of America is a population to be respected for its tradition, its beliefs and its hard work. Those who do purchase the Amish quilt are not only purchasing something of quality, but of Amish tradition. A tradition that goes back generations. A tradition of sewing circles, family values and the simple pride of hard work and diligence.